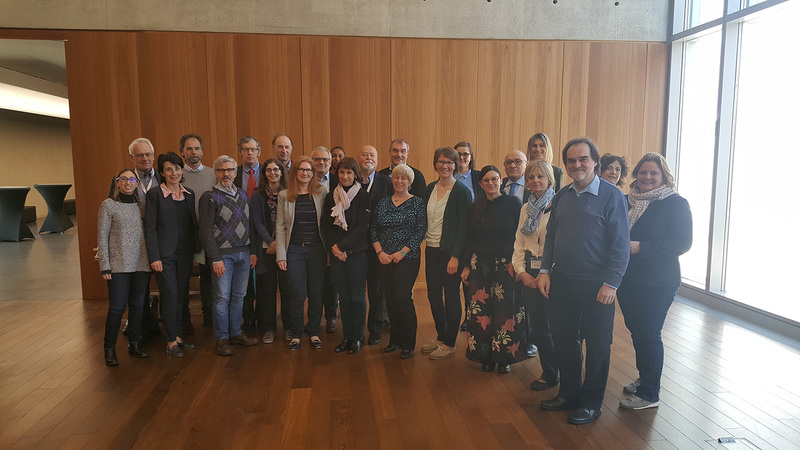 On April 10th and 11th 2018, IBBL (Integrated Biobank of Luxembourg) hosted the SPIDIA4P consortium meeting at its new premises in Dudelange, Luxembourg. SPIDIA for Personalised Medicine (SPIDIA4P) is a support and coordination action funded by the European Commission under the Horizon 2020 programme. It seeks to initiate, develop and implement a comprehensive portfolio of an additional 13 pan-European pre-analytical CEN/TS and ISO/IS documents, as well as external quality assessment schemes (EQAs), addressing the pre-analytical workflows applied to personalised medicine. Leveraging on its extensive expertise, IBBL is in charge of developing the External Quality Assurance (EQA) schemes that accompany the procedures. IBBL had the pleasure of welcoming over 30 participants from the 19 consortium partners of the SPIDIA4P project. These include representatives from SMEs, public institutions and the German Institute for Standardisation (Deutsches Institut für Normung – DIN). The meeting was chaired by QIAGEN, project coordinator. On the first day, the event provided an overview of the project and its advancement, before delving into the detailed progress report, status and action points specific to the various work packages (WP). In particular, day 1 focused on WP1 (Development of new pan-European and International Standards for pre-analytical workflows needed for Personalized Medicine), WP2 (Develop External Quality Assessment Schemes for the pre-analytical phase), WP4/6 (Project Ethics/data privacy and IP issues and IP management and Ethics requirements) and WP5 (Management). The session terminated with a dinner, where participants had the opportunity to exchange on the proceedings of the day. The first half of the second day was entirely dedicated to discussions on the status of tasks, decisions and action points under WP3 (Implementation and Dissemination of Standards & External Quality Assurance Schemes). The session will ended with the Governing Board meeting. SPIDIA for Personalised Medicine (SPIDIA4P) is a support and coordination action funded by the European Commission under the Horizon 2020 programme. It seeks to initiate, develop and implement a comprehensive portfolio of an additional 134 pan-European pre-analytical CEN/TS and ISO/IS documents, as well as external quality assessment schemes (EQAs), addressing the pre-analytical workflows applied to personalised medicine. Leveraging on its extensive expertise, IBBL is in charge of developing the External Quality Assurance (EQA) schemes that accompany the procedures. “Standardised procedures reduce the incidence of irreproducible pre-clinical and clinical research results and, in this particular case, of diagnostic mistakes”, said Fay Betsou, Chief Scientific Officer at IBBL and leader of WP2. “Ultimately, the goal is to improve disease diagnosis, prognosis and patient stratification”. For more information please visit the official SPIDIA website.